What a beautiful day we experienced with Conner yesterday. 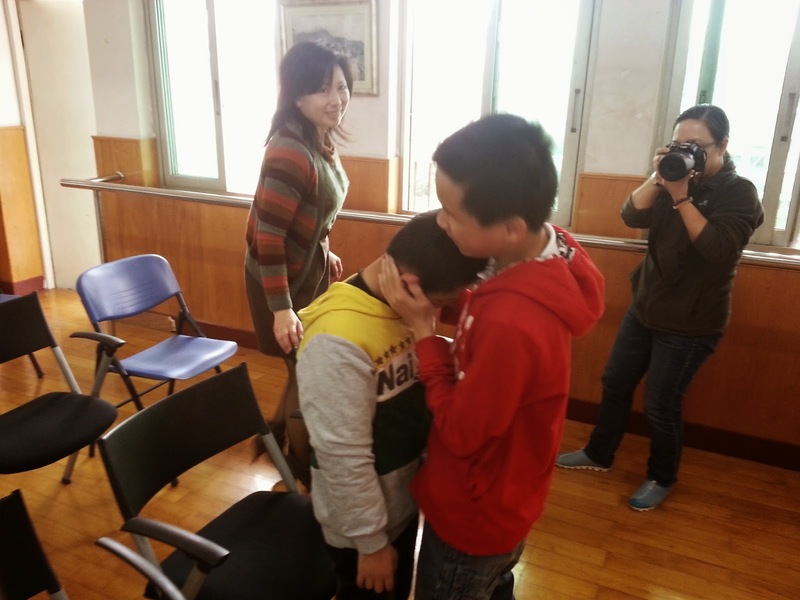 We had the opportunity to visit his orphanage in Wuhan. Through the years we have visited most of the orphanages that our children have lived in. They have all been well-kept facilities with providers who seemed to genuinely care about the children they were helping. But there was something different about the facility in Wuhan. There is a special spirit there. We could feel of the great concern and love and hope that the staff had for the children. We started out our visit by pulling into the drop-off area. As we got out of our van, we noticed something we had never seen before: a massive TV screen showing a loop of a 5-minute video about the Wuhan Children’s Welfare Institute. It was a well-done presentation that talked about the needs of the special children being cared for in this facility. 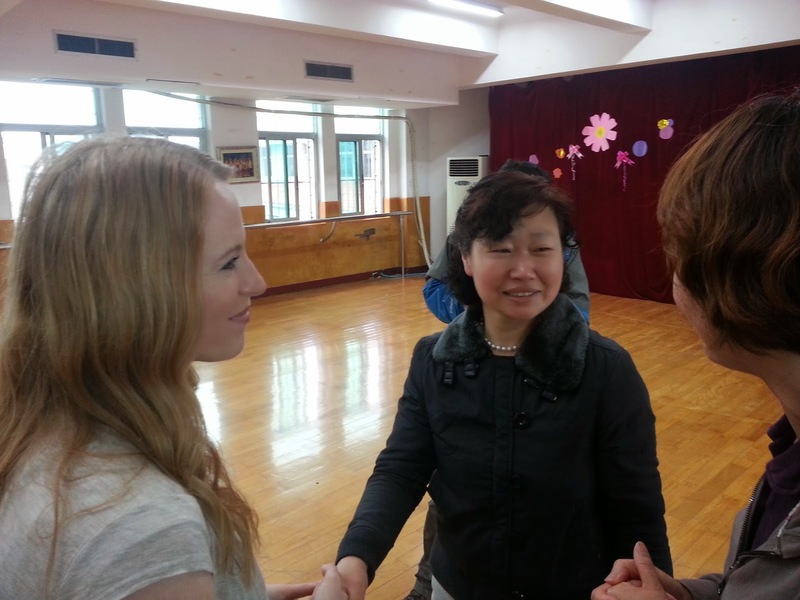 It shared stories of kids who have been adopted by in-country and foreign families. Several of these kids had returned to the orphanage to visit, and one is even the current art teacher there. This particular man immediately became near and dear to our hearts because of his lack of hands and his ability to do his artwork with his feet. They gave us a copy of the video and we’ll try to post it when we get back home. Conner has a short bit in it. 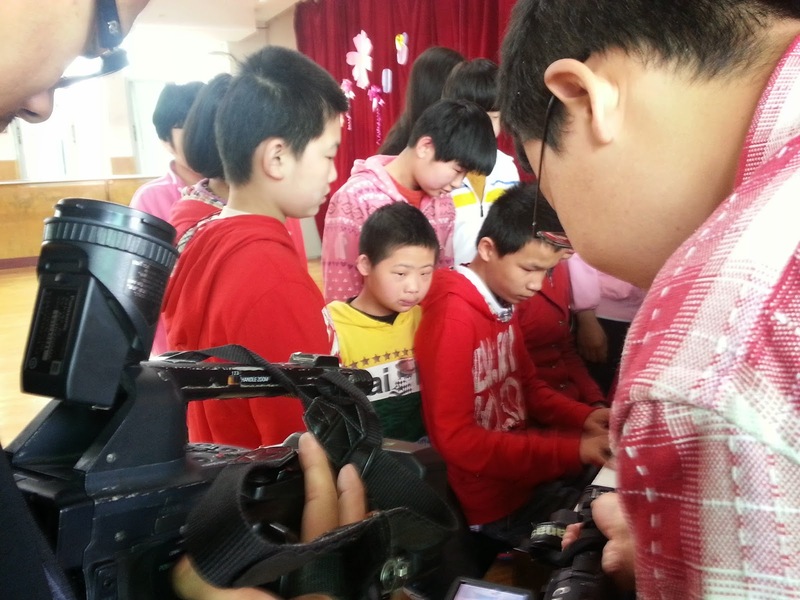 We were greeted by many of the orphanage staff as well as a local TV crew. 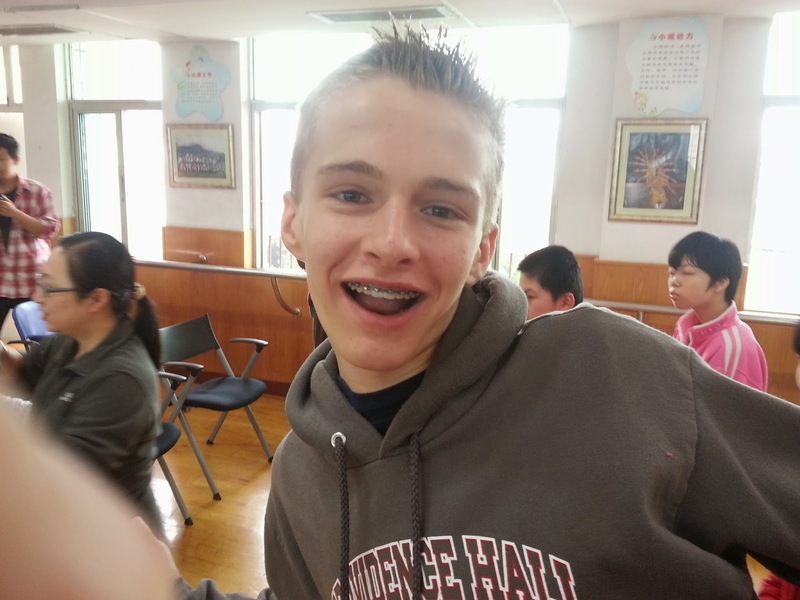 Apparently Conner is a bit famous in Wuhan. The day before we arrived, his story was in the local newspaper. The cultivation of his tremendous musical talent despite his blindness combined with his being adopted by an American family has been of interest to the local government and news media. They will be running a TV news story on him throughout the entire province in the next day or two. By the way, when you say “local media” in China, for many cities, including Wuhan (population around 10 million), that would be one of the largest markets in the US. The first room we went into was filled with some of Conner’s closest friends. They were all very excited to see him. He was immediately led to the piano and the kids crowded around him. He started to play a song and they all joined in singing. We’re not sure what the song was, but it was so sweet to see how the kids loved performing with him. After the song was over, we were introduced to Conner’s foster family. This group of 4 kids stays with the same foster parents every weekend, then comes back to the Welfare Institute during the week. Conner and another 12-year-old girl have been foster siblings for the last seven years! This poor, sweet girl was inconsolable. She was clearly devastated to lose her foster brother and friend. Her tears flowed freely and both Christi’s and my hearts ached for her as we watched. Conner’s foster mother was also there with a huge bag full of some of Conner’s favorite foods. She clearly had a tender heart and loved these five kids she was fostering. We had some gifts for them as well. One was a baseball cap with the BYU “Y” on it. She put it on the head of the youngest foster sibling, a boy around nine or ten years old. This little boy had a pout on his face and said, “No! Jiaxia (Conner’s Chinese name) is not my best friend now! He is not nice anymore! He is leaving!” Clearly, Conner is loved by his peers, and for good reason. Fortunately, we found out that at least a couple of his foster siblings have their paperwork ready at this point and have their files with adoption agencies. 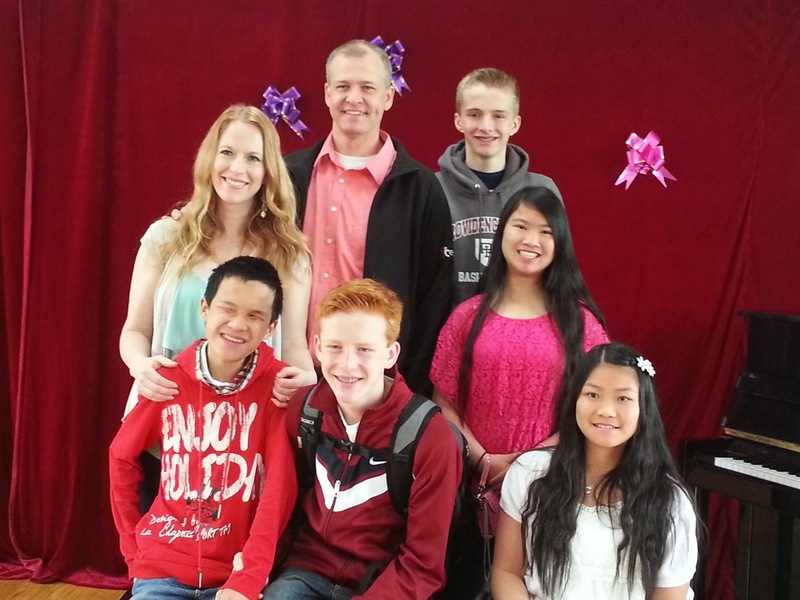 Our prayers will be with them to find their forever families! You can’t really explain just how outgoing our newest little man is. He is the huggingest, lovingest, “I-love-my-family”est, “My-family-is-so-friendly”est kid you've ever seen. He is SO soaking up having parents. Dozens of times a day he will tell each of one of us how much he loves and and give us a huge hug. He is a social butterfly. Every time someone says something in English he asks what was said. He loves to be part of things. He has the sweetest disposition and always wears his world-class smile. Seriously, he’s been with us for five full days now, going through what is normally a challenging transition, and I haven’t once seen him look sad. He just keeps saying, “I very love my family!” He has looked serious occasionally, when asking questions about school and the logistics of living in America. He wants to know what he’s facing when he gets to his new home. But he is truly just the most joyful, loveable kid you've ever met! We are SO grateful and so sure that he was just meant to be part of our family. After a little while, Christi did what the women in my life (e.g. my mom) have been doing since I was about eight years old. “Jeremy can play the piano, too! Would you like to hear him?” Of course everyone wanted to. So I sat down and played Great Balls of Fire with all my heart. I don’t think the kids were used to such vim and vigor. Some were scared. Lots laughted and smiled. Afterwards, Conner said, “Daddy scared me. He is so good. Will I be good enough?” CuteJ. And yes, Conner, you’ll be great. I’m not that good, I’m just loud. After meeting with all of his friends we moved on to a tour of the orphanage. We walked past rooms with kids of all ages, from infants to teens. Christi couldn’t help herself from picking up one particularly cute infant girl. She is already looking forward to being a grandma. (No pressure, kids!) It is always heartbreaking to see these sweet children of God. They are in a good place with good people, but is doesn't make up for not having a mom and dad. It is hard not to cry. We ended up in the room where he practices piano. His orphanage piano teacher was also there. At first we didn't realize the significance of where we were. But then his teacher told us that Conner had a song he wanted to play for his mom. She asked Christi to stand by the piano. He began to play “Near, Far, Wherever You Are” (theme song from “Titanic”) as she sang with him. Christi and I immediately realized we were hearing the same song played in the same place where we had first been introduced to our little boy on video, and we both burst into tears. (Of course this was documented by the TV crew. Nice!) It was so beautiful to see that scene recreated. The teacher was leaning over him and singing, just like in the original video that allowed us to fall in love with him. It was an unbelievably beautiful moment we felt so privileged to experience. 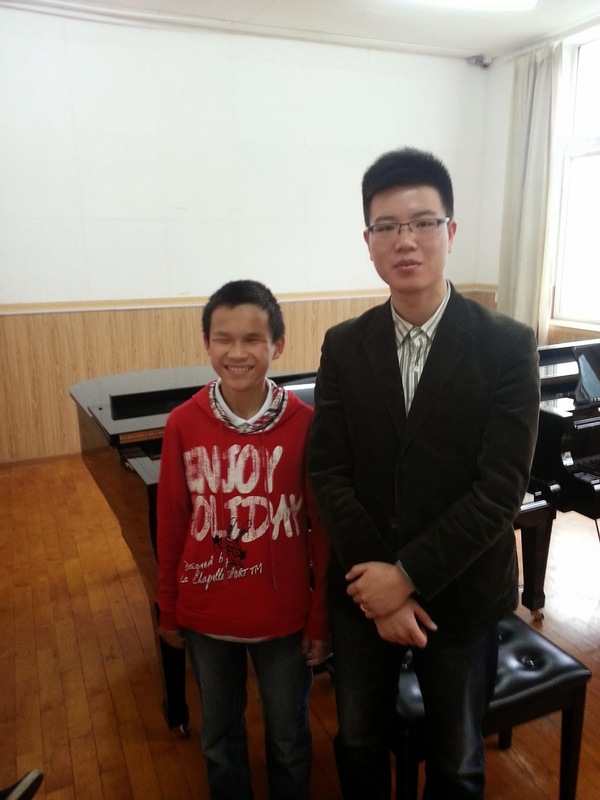 Afterwards, his piano teacher spoke to us for a long time. She told us several stories about our Conner, including how shy and introverted he once was. 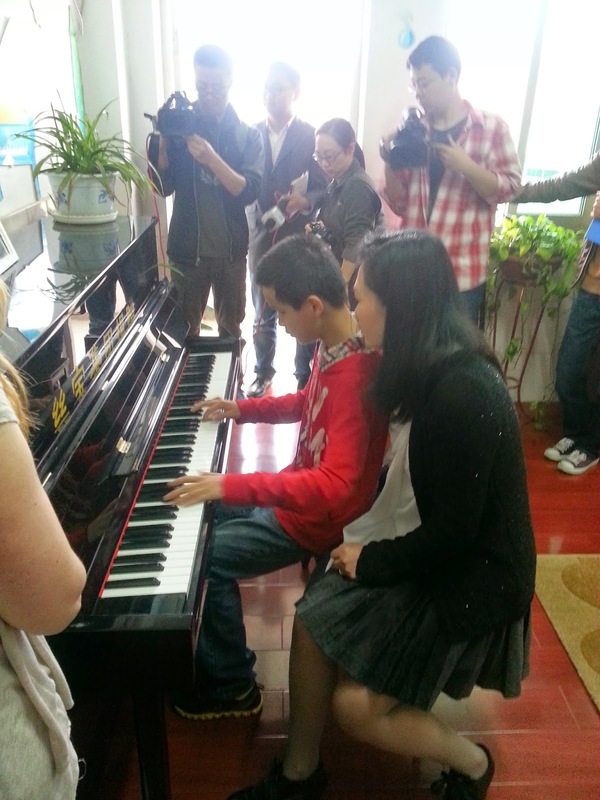 Our favorite story was how when she first began to teach him, he told her he wanted to be a professional pianist. She told him he would have to practice very hard at least three hours a day. She then left the room but kept checking on him without letting him know, wanting to see how long he would really practice on his own. SIX hours later, he finally stood up and began to leave the room. He needed to go to the bathroom so badly that he didn't quite make it—but he had been too afraid to ask to stop practicing. (: She also told us that he had asked her “thousands of times if a real mom and dad would ever accept him because he was blind.” Ahhh. Tore at our heart strings. She said that she kept telling him that if he wished it and felt it in his heart that it could come true. The whole conversation was very touching and humbling and made us realize even more what a special young man he is. 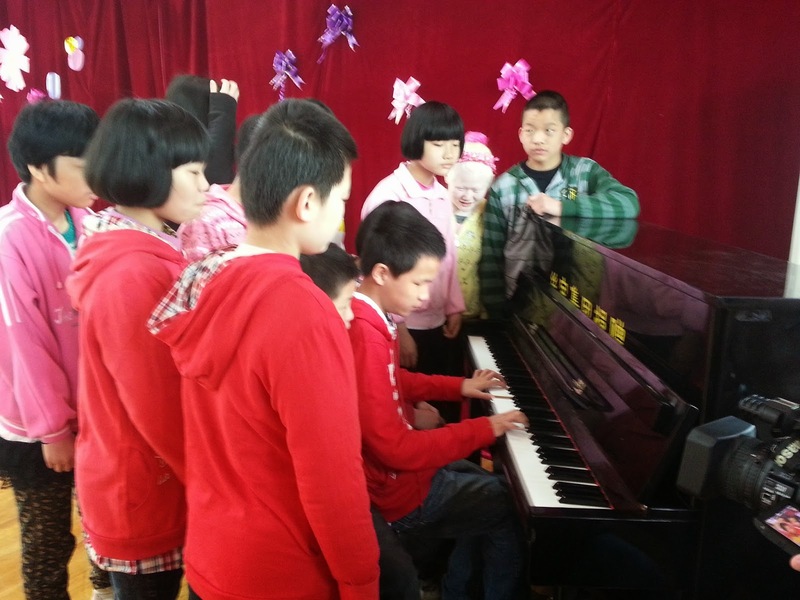 Once we were done at the orphanage, we went to the music college in Wuhan. A couple of years ago a high-ranking official in the Wuhan government met Conner and was extremely impressed. He arranged for Conner to receive free weekly lessons at the college from an accomplished professor there. (In fact, this professor will be performing in Pennsylvania in July and we’re hoping to get Conner out there for the concert.) We had the chance to meet this professor and watch as he gave Conner a short lesson. It was here that we began to understand just what an incredible musical ability he has. The teacher would play a series of notes from a new song and Conner would quickly be able to imitate them on a second piano. Within minutes he was able to imitate a complex musical phrase, including dynamics and touch. It was really quite incredible. We are so excited to see where he can go with his music. It is clearly very important to him. We are now in Guangzhou. Can’t believe we’re halfway through! We really loved Wuhan. It’s a beautiful city on the banks of the Yangtze river. We spent a day exploring a beachfront park and the Yellow Crane Tower. We also had tons of fun in the hotel swimming pool. At least some of us went swimming every day we were there. (And of course we were required to purchase the lovely swim caps many Chinese pools require!) We had Burger King and McDonald’s and a knock-off pizza hut and room service and a couple of nights of ramen cooked in our hotel room. In spite of the names of those restaurants I mentioned, the ramen was probably the most American food we had. We will miss this beautiful city and hope to be able to bring Conner back someday. Thanks for all of the prayers and service and support and love. We feel their effects and appreciate all of you so much! It's so fun to get to know Conner before we've even met him. Thanks for making him a part of our lives! Connor is so cute, I just love his smile. Thank you for sharing your journey with us. Thank you so much for taking time to keep us in the loop! We can't wait to meet Connor!!! We have sure enjoyed reading your posts and looking at all the great photos! It is so heartbreaking that there are so many children there without families - it sure makes me want to bring some home when I see their faces and know they are real, not just a name in a far off place. I am loving reading your blog. Conner sounds so, so wonderful! I am so happy for you ALL. What a privilege it will be to have him in your family. Congratulations! Love your posts. Have talked to Savannah and Christopher about Your Family. Savannah is excited to see all of you, esp Jessi. Christopher just takes it all in and will have more questions as the time to visit gets closer. This post had me in tears - how grown up he looks now - and he's so clearly loved. Praying for his foster siblings left behind. May they find such wonderful families. Safe travels, and praying for Cali in GZ with the access issues. I am loving your blog and this trip (and praying that G-d moves my husband's heart to adoption!). Did you know that you can borrow braille music from the Library of Congress? It's wonderful that Conner has such a great ear, but he need not be limited only to learning that way! I had a blind student who utilized the LoC a lot for music - each volume is huge and weighs as much as a small dog, but they send it right to you, or used to.